Vase, glazed earthenware. Sloping, slightly rounded sides raise from base to everted lip. Interior of bowl and lip have ivory glaze. 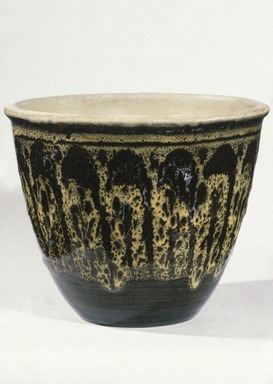 Exterior of bowl dark brown with pale green drips and streaks in heavy glaze. CONDITION: Crackle in glaze, otherwise good.